If you like what you see, please subscribe to follow along either in a Reader or by email! Appropriately priced goods and services are an integral part of a successful business. One of the most popular products at CustomExcelSpreadsheets.com is a customized cost calculator spreadsheet, and is the subject of this spotlight. The Cost Calculator spreadsheet is customized to work for the customer’s needs, with clearly marked places for the customer to input pricing and bulk information for raw materials, other costs, and sell prices for goods and/or services. The spreadsheet uses this information, along with any other factors important for the business, to automatically calculate the costs per item and profit margins. The spreadsheet also generates a report with a table and graph showing the relative costs of materials used to create the product. The customer can then make adjustments to bulk materials costs and/or sell prices and understand how the changes will affect the bottom line. As an example, imagine you own a pizza restaurant and need to know what to charge for your pizzas. Put very simply, each pizza is made up of dough, sauce, cheese, and toppings. Since these items are all purchased in bulk, or perhaps even made from scratch, there will be formulas programmed into the spreadsheet to determine costs of ingredients per pizza, including conversions from bulk purchased quantities (say gallons or pounds) to the small measured quantities (ounces or grams) that go into each sized pizza. Costs and pricing will need to be calculated for each size and type of pizza offered on the menu. Prices for toppings can be generalized based on the most expensive or the average topping, or however you choose. The cost of boxes and plastic table top stands for take out or delivery should be factored in as well. This tool will help you understand the actual costs associated with making pizzas. You can then understand how an increase in the price of pepperoni might affect your business, for example. You can also understand what it really means to your bottom line if one of your employees puts twice as much cheese on every pizza. Prices for raw materials are constantly changing, so this exercise should also be performed at regular intervals or whenever costs change. A customized Cost Calculator spreadsheet makes it easy to update changes and re-calculate pricing or costs with very little effort. If you need help customizing a Microsoft Excel spreadsheet to meet your needs, please contact me at julie@customexcelspreadsheets.com or visit my website, www.customexcelspreadsheets.com. I am addicted to savings. Not bad enough to be featured on a reality show, but I like to save money wherever I can. Even if it is, as my husband loves to point out, a marketing ploy where big-name department stores increase prices and then mark them down 40 to 50% all the time to make you feel like you are saving oh-so-much money. Coupons are only worthwhile if you actually use them. It is a waste of time if you cut them out and shove them in your purse to be forgotten about until you clean out said purse and throw them all away expired. Whenever I clip coupons, I sort them into a small expandable file (about 4" by 6") that I keep in my purse. Most of the coupons I use are store-specific, so I sort them by store. My grocery store (Holiday Market) is a small, independent one that puts out its own coupons, so it has its own compartment. I also do a lot of shopping at Target and get coupons from them in the mail, so it has its own compartment. Other store-specific coupons go in another compartment together. I collect a few manufacturer’s coupons here and there, but not regularly, so they all go in one compartment. Receipts: I also keep a compartment for receipts on items that need to be returned. This is neater in my purse than keeping them in my wallet. 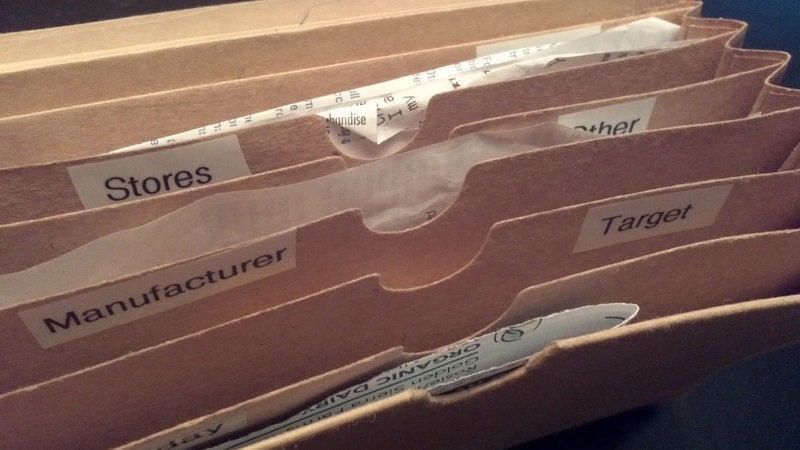 Those that clip lots of manufacturer’s coupons could benefit from sorting by item. Keeping coupons for food, household items and toiletries separated makes them more easily found while shopping. You can even keep coupons sequestered together in a simple envelope in your purse or glove box. The key is to know where they are, to remember you have them, and to periodically clear out the expired ones. If you prepare a shopping list, you may want to go through your coupons at the same time and keep the ones you know you will use for that trip together. Some bigger grocery chains have cooperative agreements with big manufacturing companies, such as P&G Everyday Solutions, through which you can select coupons online that can be linked to your Club Card and used automatically. Happy Saving!!! Please share your thoughts on how to organize coupons! Although my children are still too young for back-to-school, my work schedule changed this past week, which led to an upheaval of the routine that had been working nicely for our household for quite some time. My new schedule will restrict my time to get things done (like writing blog posts!). To make matters worse, in order to eek every possible second out of our end-of-summer vacation, we got home from a road trip last weekend very late the night before the start of our new schedule. My first order of business now is to figure out a new routine that will minimize stress through our hectic new schedule as much as possible. This makes me realize just how much I rely on a working routine and schedule to keep my life organized and my sanity in check. The first step to developing an effective routine or schedule is to identify those tasks and systems that need to be a part of it. Some parts of the schedule will be obviously set, such as work/school hours and general meal times, and will form the basic backbone of the schedule. Others tasks or systems will be things that must happen regularly, but for which the time won’t matter as much, such as returning phone calls, responding to emails, opening mail, or taking baths/showers. Also include or block off time to focus on completing important tasks. At work, especially if your job requires you to attend many meetings or to provide customer service throughout the day, it can be difficult to complete tasks that require focus. At home, you should sequester time in the schedule for your family, such as play time, family outings, and kid-free time, just as you would at work. Next, prioritize any flexible recurring tasks in order to make sure those things that are truly important have a place in your routine. Please note: They can’t all be the highest level of priority! The 7 Habits of Highly Effective People emphasizes a matrix approach to prioritization, in which you assess both the urgency and importance of a task in order to effectively prioritize it. Only those tasks that are both important AND urgent should be addressed as they come up. If you can refine your ability to assess the urgency of important tasks, you will manage your work or life much more effectively and lower your stress level. I consult for several start-up medical device companies, and I often get phone calls from executives wondering about regulations. It is easy to view these important questions as urgent, especially when they come from executives, but instead I commit to a response time (set a realistic expectation) and schedule time in my routine to research and respond to the inquiry. Urgency often has to do with the expectations you’ve allowed others to set for you (or you to set for yourself): when a customer expects to hear back from you on an inquiry, when your boss expects a report to be completed, when you need to complete a project, etc. Set realistic expectations for yourself, otherwise you may find yourself constantly putting out fires and getting stressed out. Another key to developing an effective schedule is to remember to include buffer time and not make it so rigid that there is no room for flexibility. While I am a planner and would be happy with pre-defined days all the time, my husband is not and it would wear on him and our marriage if there were no room for spontaneity. Developing a working schedule can increase productivity at home and at work while minimizing stress. But it is important to remember to use it as a tool, and not yet another daunting task. Once you figure out what works for you, you’ll keep doing it because it is just easier that way and makes life more manageable!! Something about having our things beautifully organized has a very calming effect on me. Beyond the obvious joy I get from organizing a small piece of the chaos in my house, when that organization is also presentable it brings me to a whole new level of pride. The simple beauty of storing my fruit in a large clear bowl pretties up my countertop and makes the act of storing fruit seem a deliberate part of my kitchen decorating scheme (okay, one of the only parts of my kitchen decorating scheme). 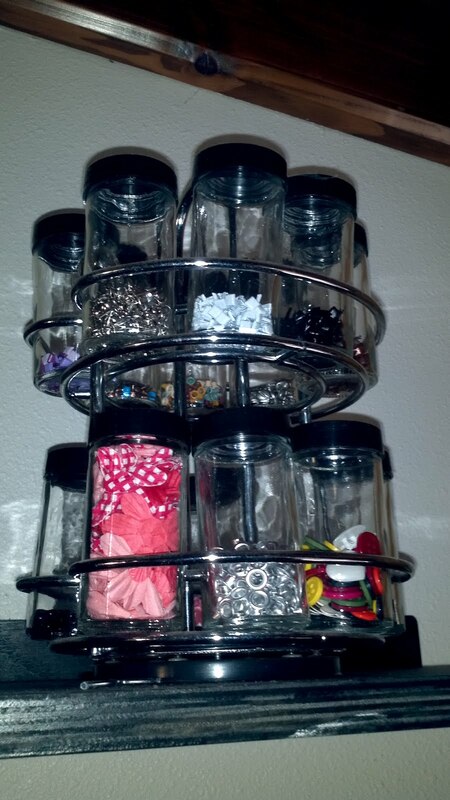 A pretty organizational tool I love is the clear jar. Mason jars are readily available and very inexpensive; I picked up six half-gallon jars for around $12 at my local hardware store. Because our kitchen has limited cabinet space, I decided to put some of our pantry items right out on the counter in these large jars. Cereal, rice and pasta look pretty in them. And since “permanent” marker cleans completely off of glass with a little rubbing alcohol, I can transfer directions or other information right onto the jar and get rid of the cardboard container. I also store long spaghetti or fettuccine pasta here in a taller jar from IKEA. They are displayed on a lazy susan to make accessing any jar a breeze. These storage containers come with a few added bonuses. 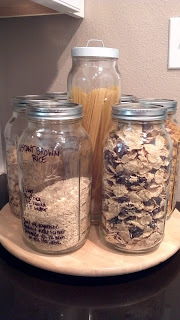 The jar seals prevent these pantry items from going stale much better than their original containers. And I really like the idea of keeping my food away from plastic wherever possible. 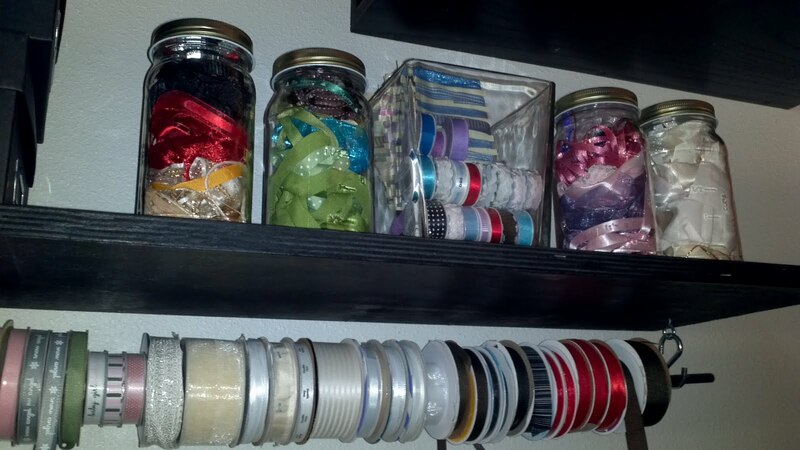 I keep any scrap of ribbon that I could possibly use again. I used to keep them all in a black photo box, like many of the tools in my work area, but I found that they were out of sight, out of mind there. On a related note, my daughter loves the jarred peaches at Costco. I got them because I am trying to minimize the BPA-lined canned food items we purchase, but they come in wonderful pint-sized jars that even have ½ cup graduations on the sides. A little Goo Gone and the label came off nicely, leaving a very pretty clear jar. I separated the scrap ribbons from my box into four jars of somewhat related colors, and now not only do the ribbons look very nice on my living room wall, but I’ve also used scraps for projects now that I can see exactly what I have. I also re-purposed an old rotating spice rack with clear glass jars as embellishment storage for small brads, buttons, grommets, and flowers. I’ll definitely be using clear jars in other areas of the house where things are pretty enough to do double duty as organized decoration. I have received several suggestions/requests for blog posts on particular topics, which I am working on posting. If you would like to see a post on a particular topic, please let me know, either by email or by commenting on this post, and I will do my best to provide a well-researched post. Customized spreadsheets can help organize your life or business. Visit Custom Excel Spreadsheets to learn more!